What is Health Club Management? Brainmeasures is a well-respected and trusted online certification and testing company which is also capable of offering the best and the most comprehensive certification programs designed to fitness. It offers a platinum personal trainer certification course which is considered to be a package of different courses which tackles the different ways to improve one’s health and fitness. This personal or fitness trainer certification package comes with twelve individual fitness courses and included in it is the health club management certification program. You are given the option to take up the package if you want to learn more about other areas linked to fitness, health and nutrition aside from improving your background in the health club management process. But if your focus is directed towards learning the basics of effectively managing health clubs, then taking up the health club management course can already do good things for you. What makes the health club management certification program from Brainmeasures a good choice is the fact that it was well-researched and developed by professionals who have enough knowledge about the fitness industry and the process involved in effectively implementing the health club management process. This means that the entire program including the health club management exam which is a major part of it and which you need to pass before you receive your certificate is developed in the most detailed and comprehensive manner, thereby giving you all the information that you need. 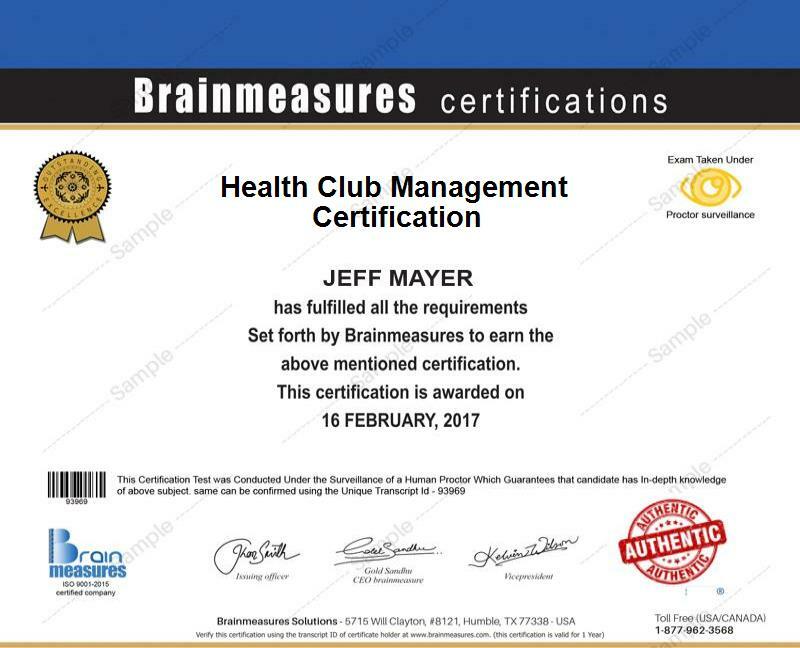 The health club management certification program from Brainmeasures covers a wide array of topics designed to help you become an expert in effectively handling, supervising and managing all the affairs of health clubs. If you want to get this certification course, then it is best if you view its syllabus after you register with Brainmeasures through the platinum trainer certification program so you will know exactly what you will be getting. Here is just a glimpse of what thehealth club management certification program from Brainmeasures can offer. The health club management certification program from Brainmeasures is primarily designed for fitness enthusiasts out there who are aspiring to establish their own health clubs sometime in the future and make sure that these clubs continue to survive despite the extreme competition in the fitness industry. This is also designed for fitness and personal trainers and aspiring health club managers who want to contribute a lot in the success of a health club. Bureau of Labor Statistics (BLS) states that there will be more job opportunities for fitness experts and professionals on the coming years. The reason behind this is that there is a huge increase in the number of people who wish to spend a portion of their income and time on health clubs and gym memberships. The high demand for fitness experts and health centers at present is also capable of increasing your potential salary after completing your health club management certification course. In fact, Indeed.com reports an average annual salary of $77,000 for health club management certification holders which has the tendency of rising after gaining more knowledge and expertise in the field.